1. Who is the Company’s transfer agent and how does a registered shareholder contact the agent regarding account information? 2. Does the Company offer a dividend reinvestment program (DRIP) for its common stock shareholders? 3. Does the Company offer Direct Deposit of common stock dividends? 4. How can I buy the Company’s common stock or sell the stock that I own? 5. Does the Company offer a Direct Stock Purchase (DSP) program? 6. When does the Company release quarterly earnings? 7. When is the annual meeting of shareholders? 8. When is the record date for annual meeting of shareholders? 9. When was the last stock split? 10. What is the ticker symbol for the Company’s common stock and where is it traded? 11. What year was the Company incorporated and in what state? 12. How can I get a copy of the annual report, Form 10-K or Form 10-Q? 13. How can I contact management if I have a question? 14. How can I contact the Board of Directors if I have a question? 15. Who are the Company’s independent accountants? 16. How can I report a concern regarding the Company's Corporate Governance? Computershare Shareowner Services (Computershare) is the Company’s transfer agent and has a direct response system for handling shareholders’ inquires about change of address, account balances, recent dividend information, dividend checks, reportable income and dividend reinvestment. Yes. The Computershare CIP (CIP) direct purchase and dividend reinvestment plan offers both existing registered stockholders and first-time investors an affordable alternative for investing in the Company, including the ability to participate in automatic reinvestment of dividends to purchase additional shares of common stock. A brochure describing this service may be obtained by calling (866) 886-9902 or by visiting www.computershare.com/investor. Yes. Registered holders of the Company’s common stock may have their quarterly dividends deposited to their checking or savings account free of charge. Contact Computershare to sign up for this service. You can buy and sell common stock through an online brokerage account, brokerage house, or contact Computershare to discuss available options. Yes. The CIP plan offers both existing registered stockholders and first-time investors an affordable alternative for investing in the Company, including the ability to participate in automatic reinvestment of dividends to purchase additional shares of common stock. A brochure describing this service may be obtained by calling (866) 886-9902 or by visiting www.computershare.com/investor. The Company’s fiscal year ends on December 31. Quarterly earnings are typically released 4-5 weeks after the end of each calendar quarter. The Company’s annual meeting of the shareholders typically occurs the second Friday in May. A formal notice of the meeting, proxy statement and proxy will be mailed in advance to shareholders. The record date of the annual meeting is set by the Board of Directors each year. The Company’s common stock is traded on the New York Stock Exchange using the symbol VMC. Vulcan Materials Company was incorporated in 2007 as part of the merger with Florida Rock Industries. The Company, through its predecessor, was incorporated in New Jersey in 1956. 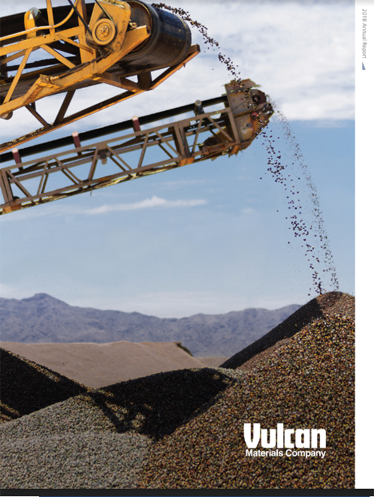 Copies of annual and quarterly reports may be requested or downloaded from our website ir.vulcanmaterials.com. If you require additional information, email your request to ir@vmcmail.com. The annual Form 10-K must be filed with the Securities and Exchange Commission within 60 days of the end of the fiscal year. Form 10-Q quarterly reports must be filed within 40 days of the end of each quarter. Click here to anonymously report a concern regarding Vulcan's Corporate Governance.